MMWD and San Francisco State University are set to begin inventorying pollinators, primarily bees, on the mountain this spring. This will be the first time this part of Marin has ever been surveyed for pollinators. 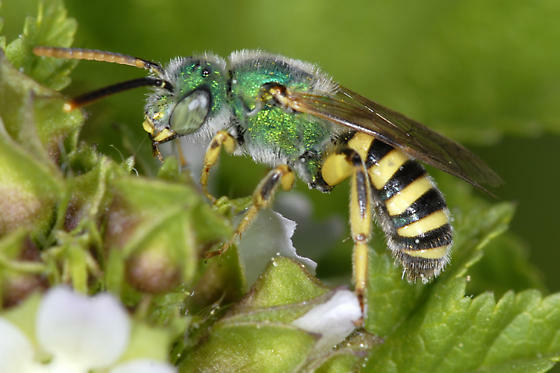 Researchers will also generate a historical species list and review plant species currently known to be extirpated or declining, to identify potential pollinator species at risk. They will also seek to understand changes in bee composition relevant to MMWD’s Forest Resiliency Project, and whether fuel break work opens up the landscape for bee populations to increase. The team has chosen sites with high wildflower diversity, a good predictor for pollinators. The sites will be sampled again in five years to study species increases or decreases – however, information from this will be immediately useful to land managers. The data sampling method aligns with methods used nationally, so the data can be compared to sites across the nation. The team may even encounter new species of California pollinators! The field season should start at the beginning of March, but may be delayed by rain. Volunteer opportunities will include specimen processing events, likely beginning in April and running monthly for a year; no experience required to participate (a great activity for kids!). In addition, there will be opportunities to help collect insects and help with the teams’ database. Contact beemarin@sfsu.edu if interested. This work has also created three internship opportunities for San Francisco State students. One Tam is excited to welcome two Conservation Management Seasonal Assistants: Josh Nuzzo and Allison Titus! Hailing from the oak woodlands of Pleasanton, Josh Nuzzo quickly developed a passion for ecology and nature. He honed his unbridled love for the outdoors and the natural world into a degree in Natural Resource Management and Conservation at San Francisco State University. Since graduating, Josh has had the honor of working with several environmental organizations around the Bay Area, including the Marin Municipal Water District and Point Blue Conservation Science's STRAW (Students and Teachers Restoring A Watershed) Project. Looking forward, he is excited to be a part of the One Tam team. After a childhood filled with ample time outdoors around her small hometown of Mount Shasta, Allison Titus migrated south to attend UC Santa Cruz. She received her bachelor’s degree in Environmental Studies in June 2016, and, more importantly, fell in love with the flowers of the coastal prairie and redwood forests. Previously, Allison worked as an assistant curator for a natural history collection, an environmental educator, a ski instructor, and a backpacking and sea kayaking guide. She is excited to continue her professional career working on Mt. Tamalpais. 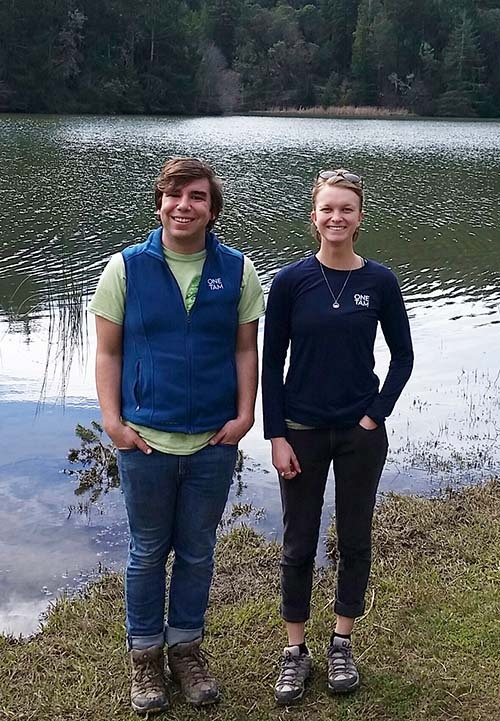 Allison and Josh will work with One Tam Conservation on the early detection of invasive species program, as well as weed treatments, rare plant surveys, and grassland assessments. You’ll get to meet them at a Bioblitz this spring, where they will also provide support to the Restoration and Community Science team. In addition, we’re happy to have aboard our new Communications, Development, and Events Intern, Angela Thomas. 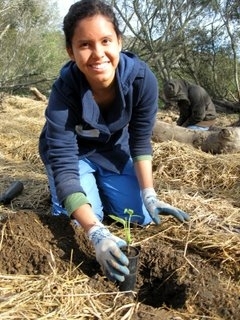 Angela is on an academic internship with One Tam and currently goes to City College of San Francisco. She is interested in the intersection of environment and health. She is majoring in Psychology and Environmental Science, and also taking courses for her Mental Health, Drug and Alcohol, Community Health Worker and Sustainability certifications. Upon her completion at CCSF, she plans to transfer to SFSU where she will major in Social Work and minor in Health. After that she plans to enter the Master’s Program for Social Work. Upon graduation in 2023, her goal is to get a Ph.D. in Environmental Science. She is really enjoying her tenure here with One Tam and hopes to stay aboard. In addition to regular excursions with family and friends, Nancy organizes a yearly memorial hike to benefit the parks in honor of her late husband, Keith Benjamin. “It is an honor to help protect and nourish the mountain by growing the next generation of stewards,” she says. Nancy encourages businesses to reach out and get involved by visiting onetam.org/business-club. For more about the community ambassador program, contact Monica Stafford at mstafford@onetam.org or (415) 991-0877. 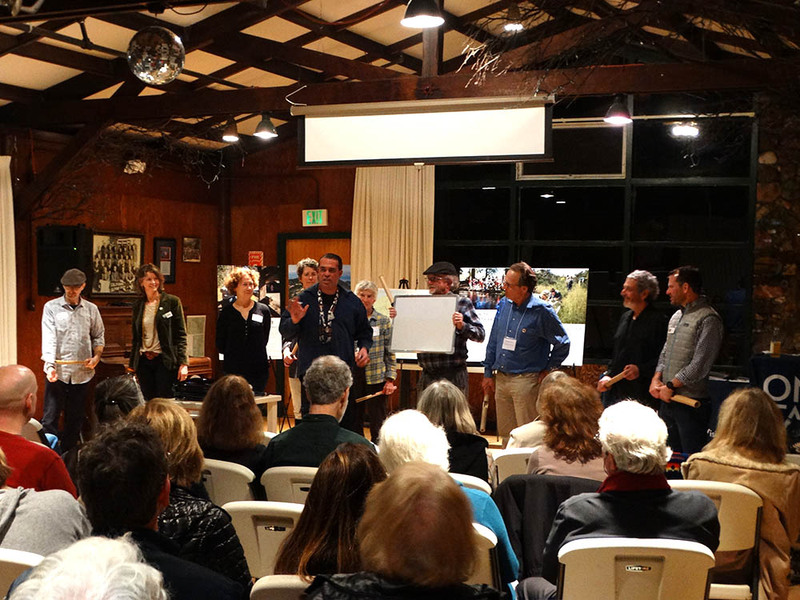 On Feb. 10, The California Alpine Club hosted an inspirational evening to explore our spiritual, historical, and creative connections to Mt. Tam, expressed through film and song. The evening began with a sunset walk led by NPS Ranger Mia Monroe. Miwok artist Sky Road Webb led the group in traditional songs and described the Miwok’s spiritual connection to Mt. Tamalpais. Filmmaker Gary Yost also screened highlights of his films that discuss the mountain’s rich history and unknown future. And musician Dore Coller closed the event with a special original song dedicated to the mountain. The event also focused on the new work by Marin Municipal Water District and One Tam to examine the restoration of the mountain’s West Peak. Find out more at onetam.org/programs-and-projects/west-peak. You too can participate in the process of evaluating the path forward for West Peak! Check onetam.org/calendar for public walks, findings of technical studies and development of alternatives, and new ways to stay involved! Saturday, March 18: Member hike. Marin Headlands Spring Wildflowers and Butterflies Walk. 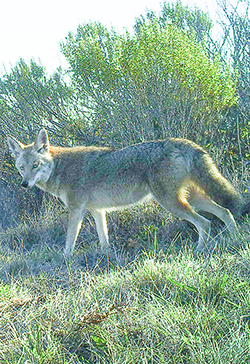 Led by the Park Conservancy's Marin Community Program Manager, Price Sheppy. Saturday, March 25: Bioblitz. Help document plants and animals of the Mt. Tam region at Roy’s Redwoods. Saturday, April 15: West Peak Walk with filmmaker Gary Yost and MMWD Ranger Matt Cerkel. Saturday, April 22: Mountain-wide Earth Day! Commemorate Earth Day with a morning of service on Mt. Tam. Details coming soon on onetam.org/calendar. Tickets go on sale March 20 for a very special night on the mountain, coming this fall. One Tam is partnering with Outstanding in the Field to host a benefit dinner on the mountain, for the mountain. This will be a dining experience befitting its stunning setting, featuring locally sourced ingredients from Marin’s best farms, prepared by Bay Area chef Charlie Parker. This event is expected to sell out fast so secure your spot as soon as they come available! Check onetam.org/calendar for more opportunities offered by One Tam partners. 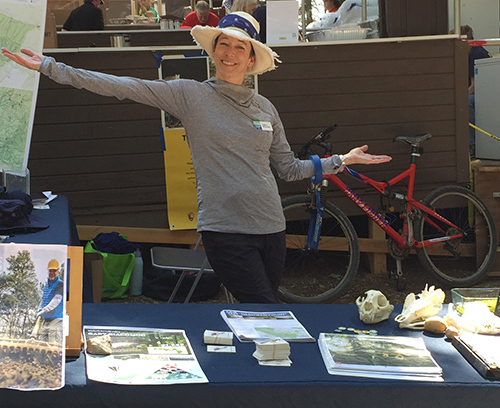 Come out and work with us on restoration and trail projects on State Parks lands! These monthly volunteer opportunities are offered the second Saturday of the month, 9 AM–Noon. Keep a look out for details at onetam.org/calendar. LINC Applications Due March 19! 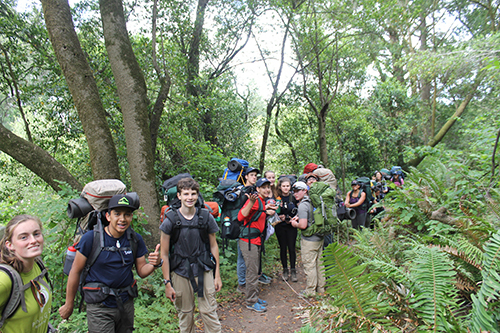 Linking Individuals to their Natural Communities (LINC) is a six-week summer internship program for high school students interested in the environment and motivated to work in and explore the natural spaces around them. No past experience is necessary; basic requirements include enthusiasm, openness to new experiences, and eagerness to learn new skills. We also focus on leadership, team-building, and career development. The program kicks off with a four-day camping trip in Yosemite, followed by a summer filled with habitat restoration, service work, and outdoor adventures all across the Mt. Tamalpais watersheds! The program runs June 26–August 4, and students receive a $1,000 educational award upon completion. Interested? Learn more, watch a short video, and download the application. The “wildlife picture index” is a statistical method used to understand where and what kinds of wildlife appear in an area. Data from this project will become part of a global database of wildlife study through this method. Locally, this work will help us improve our study and conservation of wildlife on Mt. Tam. Check our website for updates and for how to get involved.